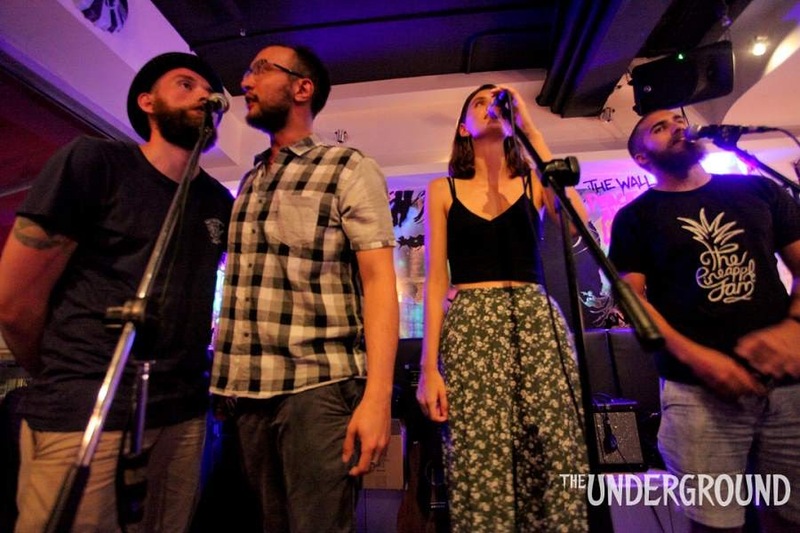 The five-piece folk blues band from Sai Kung bring their unique and colourful sound to Rustic #3 and light the place up in a blaze of bluegrass glory. They’re a proper bona fide band, and clearly have been gigging a while, showing in their relaxed stage manner. Our first spread of Pineapple Jam is their rendition of the old American folk song St James Infirmary Blues. George De Risley’s bluesy harmonica the driving force of this Yo Yo Ma-esque version. I love how every member of the band seems to have a turn taking centre stage, it’s like we don’t know what’s coming next. We are on our toes! Singer Kira Albarus really brings the song home along with this band’s tight harmonies. She has a bit of Florence Welch about her voice and a hell of a presence. For a five-piece they’re making so many sounds, they’re more like a bluegrass orchestra – banjo, guitar, tambourine, harmonica, and seemingly endless voices. All separate and on the same team. The in-between song banter isn’t bad either, apparently they don’t leave Sai Kung much and that they’re country pumpkins. Could have fooled me, they look perfectly at home in the big city on this hot Saturday night. Hard Times Come and Go is a cracker of a song. Bit of a gypsy vibe going on, reminding me of a favourite band of mine from Ireland called The Eskies. It’s got such energy. Suddenly George pops up with a mandolin! Has he been playing that the whole time? Oh and now there is a kazoo solo! I’ve died and gone to bluegrass heaven! Fifth song of the night, Typhoon was written by banjo-player Simon Thomson, who has given me near fatal beard envy. An original song, with such a bluesy harmonica it feels like we’re in Chicago for a moment. Just as I’m thinking I love the source material but it’s not quite got the same intensity as their previous songs, it roars into life with George’s harmonica solo. This is cowboy music. Befitting of a scene where an “ain’t nuttin but trouble” cowboy has just walked into a saloon looking for the guy who stole his horse. Smokey Bandits is another song I’ve not heard before, so I’m not sure if it’s a bluegrass standard or an original. But it’s got what now seems to be their trademark energy with a driving rhythm you can’t help but tap your foot to. We are gifted with the sea shanty song Leave Her Johnny as The Pineapple Jam conclude what has been a truly remarkable set tonight. The very epitome of what Rustic is all about. A fitting farewell from what is by far the sweetest pineapple in all the land.